Modesty Notice for potential viewers, there is a woman in a bathing suit in one brief scene during the video. Hat-tip to Casey of Klei Avodah. Many Tzitzit professionals have the custom never to cut Tzitzit strings with scissors or any other metal object. Instead, any necessary cutting or shortening is done with one's teeth. This idea of not using metal in the process of making Tzitzit mirrors the building of the Beit Hamikdash. We are told that it was forbidden to use any metal utensils when hewing the stones which were to be used in the construction of the Altar. As such, some suggest that the use of metal should be forbidden in the process of making Tzitzit as well. The iron blade of a witch's athame upon her altar is a perfect symbol for the rectification of evil and its elevation back into the realm of kedushah (holiness, sacredness). In the Jewish tradition, this rectification and re-elevation is called tikun olam (repair of the world). The iron of knives and swords have historically been used to shorten life, making them typically antithetical for use upon a sacred altar, whose purpose is to enhance and lengthen life. However, in the "future world" (in Hebrew "leatid lavo" לעתיד לבא, a code for the transcendent rectified feminine sefirah Binah and her parzufim), our Sages teach that the Temple will be built using iron. Normally, it is forbidden to use tools of iron to cut stones for the Temple altar. Kabbalistically, iron, one of the seven metals  corresponding to the seven mystical attributes of the heart, corresponds to the attribute of Malchut, the element of the heart most "vulnerable to negativity and egocentricity". Malchut symbolizes the feminine Kingdom of the world of action and expression (see sefirotic array here). 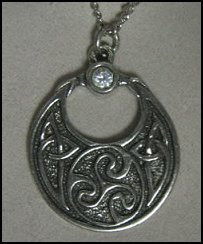 It also symbolizes the Indwelling Divine Feminine, the Shechinah. Given the intimate connection of iron with the kedushah of the Holy Temple, we can understand then, that the status of iron (as being holy or not), rests in it's relationship to shortening or lengthening life. My athame - Time Witchery. In traditional Judaism, women are typically exempt from "time-bound" (z'man grama זמן גרמהּ) ritual mitzvot such as laying tefillin. In other words, it is thought that women are not usually considered obligated to perform rituals which have a specific time associated with their performance. Women are told that such rituals are called "time-bound" because the rituals must be performed at a certain time (not conducive to performance by a woman), but the actual meaning of the phrase z'man grama is to "produce/cause/bring down/raise up results into time/life." Grama comes from two shorashim. The first shoresh is גרם meaning "lever motion", "joining limbs that cause movement", and "steps leading forward and upward". From this shoresh comes the word גָּרַם meaning "to cause, to produce, or to result in." The second shoresh is רמם meaning "raise from a low level", "elevating", "exalting" and "bringing to life." The word grama (גרמהּ) ends with a hei mappik (הּ). Taken together, the phrase z'man grama means raising up results in time which sustain and nourish life. Time-bound mitzvot, then, are rituals of action as is wearing my ritual tefillin-handflower, which brought down this dream which utlimately raised up the result of protection from the evil energy of a lion attack. Thank Goddess neither I nor the boy who experienced the lion attack in a real way were killed (see links). Move over traditional gentlemen, the Jewitches are coming. Although many things can be done by machine, tying Tzitzit strings is still not one of them. In order to render a Tallit useable, the Tzitzit strings must be hand tied onto a Tallit by a God-fearing individual. What is amusing, however, is the largely mistaken belief that it is forbidden to tie the Tzitzit strings onto a Tallit at night. The source for this misunderstanding is due to a perceived concern that doing so may be a violation of the Talmudic principle of “Ta’ase V’lo Min Ha’asui”. The Chazon Ish was known to permit tying Tzitzit at night and specifically requested that his own Tallit be prepared at such time. Read the entire discussion at Hirhurim. Interestingly, Toviah comments on this discussion that the opinion prohibiting "tying knots of the tzitzit at night" derives from a source called Sha'agas Aryeh (meaning Roar Of The Lion). Hmm. It's snowing heavily, so here I am on a Tuesday morning, sitting at my computer after getting ready for work before I realized it was snowing heavily and decided to take today off for my Sunday manager day, and thinking I should go back to bed and get some extra sleep. Maybe I will, or maybe I'll just sit here and listen to my indoor windchime in the quiet house for awhile and meditate on the peacefulness. Another synchronicity of my dreams with subsequent news events ... in follow-up to Saturday's entry describing my lion dream (Knesset Echad, Key Circle Of The Black Knot), Foxnews reports tonight of a lion attack on a 10-year boy, also on Saturday. BEIJING — A lion attacked a 10-year-old boy visiting a circus in eastern China, biting off his arm through the bars of its cage, state media said Monday. The boy was looking at the lion Saturday at Wanfota Park in Mengcheng, a county in Anhui province, when the feline lunged and grabbed the boy with its paws, pulling the child's arm inside the cage, the Xinhua News Agency said. "Park workers managed to pull the boy away, but his left arm had been torn away by the animal," Xinhua said. In my dream, the lion ran circles and did not attack. In this news report, the lion which attacked was a circus lion, where a circus is called by how many "circles" it has (for example, a 3-ring circus). I heard something very strange in shul this past Friday night. Someone heard from his Rebbe that you are not allowed to make kiddush between 6PM & 7PM because the "shaydim" are active during that hour. If one came home from shul and could not make kiddush before 6PM he must wait the full hour until after 7PM to do so. I thought that as Jews we are not allowed to be superstitious. Has anyone else heard of this new "chumrah"? It seems that new ones keep popping up every day. According to Sefer Yetzirah, the hour of 6-7 p.m. Friday evening is governed by the planetary energy of Mars, which influences such things as "blood, strife, wickedness, external injury, war, hatred and jealousy." The planet Mars corresponds to the letter Gimel, and thus through the Gimel/Mars connection, the hour in question creates a bridge into the physical world for the reality of "reward and punishment" to manifest. Should one be due for punishment, this might not be a good hour to make kiddush. Should one be due for reward, this may be a very good hour to make kiddush. 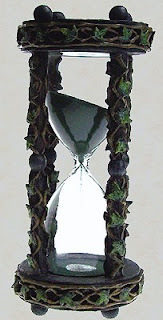 Graphic - my Witching Hour black sand timer made of handpainted cold cast resin and designed by Nemesis Now. Of the details, the following survived into waking consciousness. I was in a protected house surrounded by a "circuiting" path, like a running track. A magnificent lion-like creature ascended to the "track" around the place. The creature of singularly awesome power was potentially lethally dangerous. It's potential danger lay in the idea that the energy it embodied was discerned to be finely balanced upon the dimensionless tip of a scale of iterating measures. If the energy stayed on the track and contained within it's set boundaries, it was very good - for no enemy could cross the track of the lion. Should anyone enter the track of the lion from outside the house, the lion would encounter them in it and rip them to shreds. As the lion ran it's circuits, I needed to stay in the protected house as well. The danger of going outside for me lay not in being ripped to shreads by the lion, but in "throwing" the lion off it's finely balanced track - almost as if my presence in the house kept everything safely held together in order and balance. The lion ran circles around the protected house, looking for any unprotected opening into the house which would allow it to enter into and break the integrity of the protective barrier which completely surrounded us. In this manner, the lion tested the protective barrier which formed the inner circle and kept out harmful chaos. It found no opening. The circle stood intact. From the bayit — and the Torah contained within — flow the straps, first surrounding our heads, then tied in a knot the shape of a dalet for the word da'as, and from the reality of da'as (albeit sometimes only in a state poverty, dalus in Hebrew) flow the two straps: one to the right and one to the left, representing the general flow of the emotional attributes of chesed (kindness) to the right side, and gevurah (restraint) on the left. In truth, chesed and gevurah emanate from the same "space," the transcendental knot interweaving both these elements, rooted in the deepest place of kesser, the "black," the level beyond comprehension which is called the space for "the light of darkness." In da'as is the key to our emotions, so that they open and flow in the general direction of either right or left, giving or restraining, openness or confinement. With respect to circle of sacred space I've cast as the Jewitch Liorah Lleucu HaMasovevet, I hereby call the covered Coven of One, Knesset Echad, Key Circle of the Black Knot. Interestingly, the dimensionless tip upon which the energy of the archetypal lion balanced corresponds to the Hebrew letters yod and hei mappik (הּ) and to the dark crocheted handflower (designed and handmade by DragonInKnots) which I wore on my left hand yesterday at work for "crazy sock Friday". Instead of crazy socks on my feet, I "thought outside the box" and wore a crazy knotted sock on my left hand, in an "intended manner" of a Jewitch's tefillin, achdut ha'shaveh. In this term we can see the influence of R. Azriel of Gerona, for the concept of hashva'ah, equinimity, is central to his writings. Tishby has noted that R. Azriel "usually employs this concept in connection with the conjunction of opposites within the Supernal Root, shoresh ha'elyon." ... Although it is generally assumed that shaveh implies equivalence or balance, H. Yalon demonstrated that shaveh is synonymous with chibbur, conjoined. Interestingly, the concept of chibbur is associated with the symbolism of the lion and the barrier. In my dream, both the protective barrier and the lion are very good. "The ten (innermost) Sefirot of the direct light have no color, but when they pass through the worlds, they acquire different colors, dress into various shells, and thus manifest before us. That is how we perceive this world." "The "full spelling" of Adnut = 671. As the sefirah of malchut is often identified with targum (Aramaic, the "backside" of the Holy Tongue), the number 671 is interpreted in Kabbalah to refer to the Aramaic word for "gate," tarah (= 671). Malchut (and the power of its Divine Name Adnut) is called the gateway to enter into the mystery of the Divine sefirot, the realm of the perfectly rectified consciousness of One." As I was laying in the dark this evening, resting with my arm over my forehead in relaxing contemplation, I saw the "clear" aura of my arm against the darkness of the room. It looked like living "clear" flames radiating from my arm - a colorless fire of "invisible yet visible" radiant light. Pretty cool real energy and light from the darkness. My grandsons and I went together this afternoon to see The Spiderwick Chronicles, a magical mystical film about three siblings whose "sight" is opened to see a world full of faeries, goblins and other magical creatures. There is even a Book of Secrets in the film called The Field Guide. We had an awesome time, we human creatures journeying for a few hours into the fantastical world of Spiderwick. Near the end of the movie, Arthur Spiderwick reminds everyone, as he takes his daughter's hand into his own, that in our search to discover and interact with all the magical creatures which exist just beyond the veil, never forget to see the most magical creatures of all - our loved ones. "Google" truly is a friend in the computer age. There is so much useful information online for the budding Jewitch to explore. One version of the Siddur (translated into English and in transliterated Hebrew) is online. One can also find examples of rituals from the traditions of Kabbalistic and Magical Judaism, Witchcraft, Druidry and Shamanism online, in addition to articles on the basic structural elements of ritual making. A sampling of offline books one may purchase which explore the basic ritual elements are in my online library listing, under the tags "ritual" and "mitzvot" (as some mitzvot are ritualistic). Here are two potentially useful starter links, one outlining the basic elements of Wiccan witch ritual and one outlining the basic elements of Jewish ritual. Then, with a baseline knowledge acquired in these areas, one can create a preliminary ritual tailored toward one's own practice. Remember, it's okay to use somebody else's ritual until you feel you are ready or want to make your own. In fact, I'd advise a budding Jewitch to find one you like and start with it so that you can start "practicing", to loosen up and begin exercising mystical muscles. Even when you make your own ritual or personalize someone else's for your own use, even then, your basic ritual can morph and evolve over time as you develop a personal style. Nothing "has to" remain as it is first created. Before learning the Hebrew language (which I'm not fluent in either) learn the mystical meanings of the Hebrew letters. If you are drawn toward a second magical alphabet (I also use the Ogham, but there are many other magical alphabets which might be more interesting to you personally), learn those letters as well. Start with only one alphabet and master it first, as it could be confusing to try and learn two at once. Don't think you have to become an expert overnight - much of the spiritual development is in the journey of "becoming" what you already are most completely. I was recently asked if I could teach someone to be a Jewitch. I don't know how to teach anyone to be a Jewitch. I don't believe such a thing can be taught, it must be discovered. Perhaps methods of exploration and discovery can be taught and learnt, but the path each of us must travel is unique. That written, here is my guidance toward someone taking the first steps on a path of exploration and discovery. There are links to Jewitchy and Kabbalah sites on my blogs, and a link to my "library" from where one might find some books with which to start learning "about" esoteric subjects such as Jewitchery, Kabbalah, Witchcraft, Druidry and Shamanism. The spiritual development work doesn't really come from books however, it begins by being true to yourself, exploring your inner world honestly, and following your bliss. By "bliss" I don't mean that which is necessarily fun or pleasurable in the typical sense. By "bliss" I mean the profound sense of pristine inner joy that is one's own spark of godliness - it will never lie to you. Follow where it leads. May they be cursed by the Divine Feminine force should this despicable miscarriage of justice result in this woman's death. May Abdullah be worthy of his country's crown and extend mercy to this woman. On Wednesday evening, February 20th, the full Moon over the Americas will turn a delightful shade of red and possibly turquoise, too. It's a total lunar eclipse—the last one until Dec. 2010. Why red? That is the color of Earth's shadow. While you're watching, be alert for another color: turquoise. Observers of several recent lunar eclipses have reported a flash of turquoise bracketing the red of totality. "The blue and turquoise shades at the edge of Earth's shadow were incredible," recalls amateur astronomer Eva Seidenfaden of Trier, Germany, who took the picture shown during the European lunar eclipse of March 3-4, 2007. Dozens of other photographers have documented the same phenomenon. The source of the turquoise is ozone. 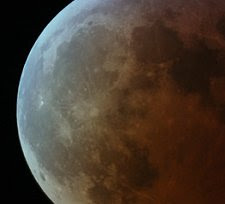 Eclipse researcher Dr. Richard Keen of the University of Colorado explains: "During a lunar eclipse, most of the light illuminating the moon passes through the stratosphere where it is reddened by scattering. However, light passing through the upper stratosphere penetrates the ozone layer, which absorbs red light and actually makes the passing light ray bluer." This can be seen, he says, as a soft blue fringe around the red core of Earth's shadow. To catch the turquoise on Feb. 20th, he advises, "look during the first and last minutes of totality." That would be around 10:01 pm EST and 10:51 pm EST (7:01 and 7:51 pm PST). Read the full article and see more graphics at the link above. February 20 is the full moon of Keolwulf, the Initiate Moon of the days of the Old Ones, in this year of the witch, and Purim Katan in the Jewish calendar. The first news event. Rocket fire. On Saturday night the 9th of February, two brothers 19 and 8 year old, Rami and Osher Twito, borrowed their mother's credit card to go to the Sderot ATM machine to buy after shave lotion as a birthday present for their father. Within moments, they were lying next to each other in a pool of blood on a Sderot side walk. Pieces of their legs scattered on the street. One of Osher’s legs was immediately severed. Osher’s second leg was shattered. Rami and Osher were running for their lives after they heard the RED COLOR siren. The second news event. Hit and run. New York City police said Sunday that they are investigating the violent street brawl that was caught on video tape involving some people who may have come out of a nearby nightclub. The video, first posted on LiveLeak.com and later reported on MyFoxNY.com, shows what appears to be a drunken street fight outside a parking garage in midtown Manhattan. At one point, one vehicle, which appears to be a white SUV, drives on the sidewalk in an attempt to flee the scene, hitting and knocking down one of the pedestrians. The NYPD said they are looking for the hit-and-run driver. Local media reports the man injured suffered broken kneecaps and dislocated hips from the incident. Read the full articles at links provided. 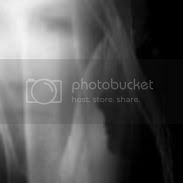 The identifying factor of the Summoning may be defined negatively; it is not any of the above categories (displacement mediumship, seership, remembering past lives, or ritually generated imaginative magical forms). The Summoning of the Ancestors is a distinct mode of awareness, which may incorporate certain features already described, such as apparent memories, information or prediction, but it is not a type of mediumship or seership, nor is it a product of magical images. As a general rule, it is a mode of awareness which is accessible to the seer, but not to the medium. What, then, is the Summoning? It is a change which occurs in the blood. It is not connected to memory, yet can produce the memories of people from the distant past. Something which happens within the bloodstream enables the individual to attune to a store or body of consciousness which transcends yet includes individuality. The prime subject matter, nearest to the individual who gains this curious change of metabolism, is that of the Ancestors from the immediate and hereditary environment. In many cases, the Summoning creates a deeply empathetic and emotional response, holding the seeds of memories of past events, often of extremely distant historical or prehistorical periods. During this early stage, the predominant memories are of difficulties, disasters, and acts of injustice upon a large scale. At a later stage, when the initial ferment has come under control, material can be selected for comprehension. The Summoning begins in the Past, but it is not confined to the past. The development of control and selection of consciousness apprehended 'through the blood' gradually brings the flow of tuned awareness into the Present, externalizing into the seer's consciousness of real or serial time (for example, Manifest Spark Of Redemptive Magic). Finally, cognition is merged with the Inner Present, the germinal area of consciousness which holds the potential of the Future. The ability to summon the Ancestors, once a central function of all magic and religion, develops from another magical power or mode of heightened consciousness, one which is frequently discussed and published, but which is meaningless as a solitary exercise out of its proper context - the Summoning cannot be enacted without first experiencing the Arousal of the Inner Fire. * The Faulkner clan arrived in America (Maryland) via Wales 22 January 1665 on the ship Agreement, setting out from Bristol. Is Queen Boudicca Buried In Northamptonshire? In 1907 a Doctor Edward Scott who worked at the British Museum came across documentation from Whittlebury Parish from around 1285. Based on these documents he pursued a theory that Boudica (aka Boudicca, Boadicea) was buried somewhere in the parish. Read more in the Whittlebury village page. In follow-up to earlier entries, 9 Magic Keys To Redemption (which arrived in the mail yesterday) and Manifest Spark Of Redemptive Magic, I dreamt this morning. Time felt both anciently existent and nonexistent, between being and not being, a twilight zone between time and timelessness. I lived within a community located deep within the earth, in the hidden (amon) underworld inner world. We came to know through sensory telepathy that the deep subterranean oceans were being broken up throughout the underworld, and soon the deeps immediately surrounding our completely enclosed dwelling pocket within the land would be affected too. Unless some miracle occurred for us, we would be covered over with many waters, obliterated, and our hidden place submerged within the deep underworld seas. In my mind, I was aware that this catastrophic event had happened many times before in antiquity clear back to in the beginning of all. It was a cosmic event that repeated itself throughout aeons of time. But, there was nowhere to escape. The deep underworld sea was all around us outside the protecting walls of our catacombed dwelling pocket. We lived completely surrounded by the deeps, and had lived our entire existence in this place. We lived in a bubble among the deeps, protected by the earthenstone walls which gave form to our inner place. But those walls were about to be broken up, and our world submerged. There was no place to escape. We waited for destiny to make itself known. It was the only thing we could do. The earthenstone walls of our protected place, like the rest of the walls within the underworld, began to break up. We could hear the rush of many waters bounding toward our little world. The walls broke and the waters came. But then, an amazing thing happened. Though the protecting earthenstone walls had been broken up and there was nothing to stop the waters, the waters stood up anyway as if invisible walls were still there holding them back! The waters stood up and themselves formed a protecting wall (chomah) around us, forming a stockade (migdal) against the onward natural rush of the waters. The former earthenstone walls now formed small stony paths of escape leading through the deep underworld seas to the surface world. The stony paths were surrounded by protecting walls of underworld deep waters standing straight up. We stepped upon the paths leading to the safety of the surface, and emerged, awaking to another day. Playing in His habitable earth, and my delights are with the sons of men. (a) So we base Rebbi Yitzchak's initial statement on a Machlokes between Rebbi Yishmael b'Rebbi Yosi and the Chachamim. Rebbi Yishmael b'Rebbi Yosi explains in a Beraisa, that the Mishnah in Erchin lists (in connection with the Din of Batei Arei Chomah) specifically nine towns out of the numerous towns that had a wall around them in the days of Yehoshua bin Nun - because those are the ones that they found and consecrated (whilst all the others lost their Kedushah with the destruction of the first Beis-Hamikdash). (b) In another Beraisa, Rebbi Yishmael b'Rebbi Yosi says - that they only mentioned these nine because they were the ones that they found when they returned from Bavel, but that in fact, all the towns that were traditionally walled in the time of Yehoshua bin Nun were sanctified (and these included the sixty towns of the territory of Argov that had previously belonged to Og Melech Habashan). (c) The second Tana's Lashon 'Matz'u Eilu v'Kidshum' is wrong - because he specifically goes on to say that they do not require consecration. (d) So we amend it to read 'Matz'u Eilu u'Man'um' (they found these and listed them'). (a) Initially, we reconcile these two Beraisos - by turning it into a Machlokes Tana'im regarding the opinion of Rebbi Yishmael b'Rebbi Yosi. (b) Alternatively, we amend the name of the author of the second Beraisa to Rebbi Elazar b'Rebbi Yosi, who (in another Beraisa), Darshened the Pasuk in Behar (in connection with Batei Arei Chomah) "Asher Lo Chomah" (which is written with a 'Vav' but read with an 'Alef') to mean - that a city that had a wall around it in the time of Yehoshua bin Nun is considered a walled city, even though it no longer has one nowadays. Interestingly, in addition to receiving my 9 magic keys yesterday, I also received one of my other recent Craftwork orders - a handmade magic megilah scroll created for writing spellwork. So, in addition to the connection with my 9 magic keys, a connection here to my one Magic Megilah also exists. The original Torah and the Tablets of the Ten Commandments was concealed in a catacomb that had been prepared by King Solomon when he had first built the Temple. It is still here today. I have 9 magic skeleton keys, each measuring in the range from 63.5 to 127 mm in length. Nine represents the 9 sefirot from Keter to Yesod (the lunar realm where the 9 collect). The value 63.5 represents Ateret HaYesod (the sub-lunar realm and the inner source of Malchut) and the 63-letter Divine Name which carries the Will to actualize (via the value 5) the power of rectified imagination. The value 5 represents the power of expression through 5 paths of The Law as described in the esoteric teachings of both Celtic Witchcraft (for example, the Tract of The Law of Kings as found in Brehon Law) and Jewish Kabbalah (for example, the 5 Gevurot of Da'at in Malchut). The value of 127 represents the perfect extension of all that came before into Malchut. Yesterday and today I attended a two-day seminar-workshop for work. Each day we were given a tabbed notebook containing the learning materials from a stack of preprepared notebooks. The notebooks weren't person-specific, we were each just given one from among the stack. After the seminar was well underway the first day, I noticed that my notebook was missing tab 5. During the break I told one of the speakers that my notebook was missing tab 5, and she gave me a new notebook, with the "tab 5" material in it. She didn't want the other notebook back and told me to just keep it. Later, I discovered that even though "tab 5" was missing in the first notebook, the "tab 5" material indeed was in the notebook, subsumed under the previous tab with tab 4 material. So, now I have two notebooks with all the day 1 material. A double portion. The first notebook just needs another divider tab. I have two complete notebooks, each with a set of tab 5 material, one set revealed, one set concealed. This is an interesting little "expressive 5" synchronicity of my "magic" with "real life", I think. More importantly perhaps, is the fact that I have done no active ritual with these 9 keys as yet other than to find and acquire them as magical tools. 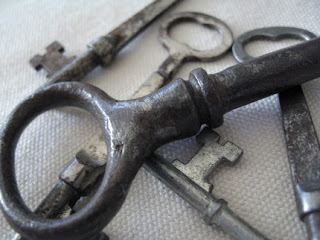 In other words, the keys and I have found one another, and we have established a manifesting connection. The redemptive energy the keys carry was looking for a way into expressive reality, and it found me. Sylphs are winged beings of the air, open spaces, clouds and protectors of Gan Eden, high peaks and wilderness mountains. A branch from among the Sidhe, Sylphs control the weather and extremes of nature. Childling Sylphs are called Cherubs. Shown is an artistic representation of the Sylphs from Crystalinks. Titled "Sylphs", I call it "Fae Of The Sapphire Skies". Though Sylphs are faeries of the air, there is nothing "airy fairy" (fluffy) about them. MOUNT AIRY, N.C. — A twin-engine plane crashed Friday as it tried to land amid low fog at a small airport in northwest North Carolina, killing all six people on board, officials said. Stephanie Conner, a Surry County emergency services shift supervisor, said investigators had confirmed there were no survivors. Surry County officials said the King Air C90A crashed in a neighborhood near the Mount Airy airport around 11:30 a.m. The plane split in half after falling into a grassy area between two homes. The plane took off in Cedartown, Ga., Woodberry said, and the passengers were on their way to Primland, a hunting and golf resort in Meadows of Dan, Va., about 25 miles north of the Mount Airy airport, according to Kelvin Boyette, the airport manager. "There was a really low fog, it was raining a little bit and an occasional sleet pellet. But visibility was more than a 2 1/2 miles," he said. The plane is registered to Blue Sky Airways in Dallas, Ga., according to FAA records.